This post brought to you by The Hershey Company. The content and opinions expressed below are that of Mom Fabulous. When I think of Easter desserts and Easter in general, one main thing comes to mind – my grandma’s coconut Easter cake with jelly beans. I looked forward to this cake every single year, from eating it to watching her make it. She would even let me help by dying the coconut green or placing the jelly beans on the top. It was a yellow layer cake with a meringue icing. That yellow cake and white icing combination was beautiful and just screamed spring to me. This year I wanted to come up with a dessert I knew my kids loved, but put an Easter spin on it. I knew it had to include some of our favorite candies from Hershey (hello yummy Reese’s Peanut Butter Eggs), as well as green coconut – both which bring me back to my childhood. It also had to be easy, because I want this to be something they can recreate for their families some day, whether they know how to cook or not. 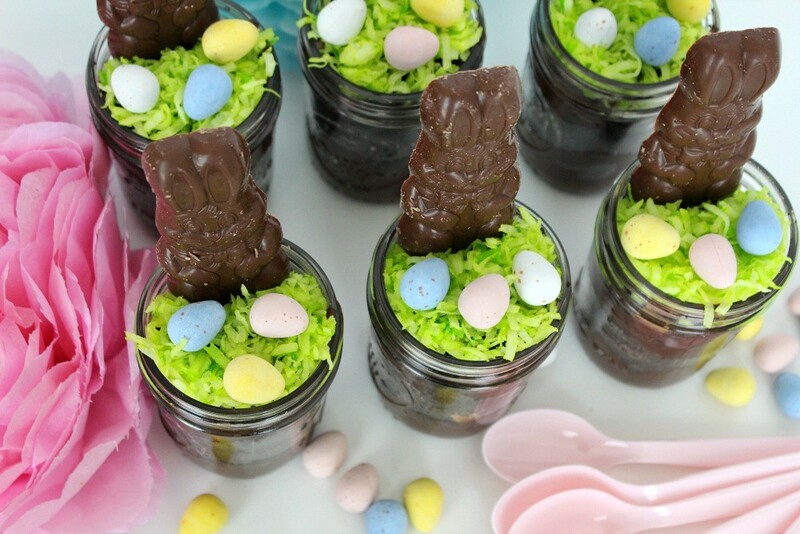 I decided on a pudding dirt cake in individual jars, with a little Easter scene on top. 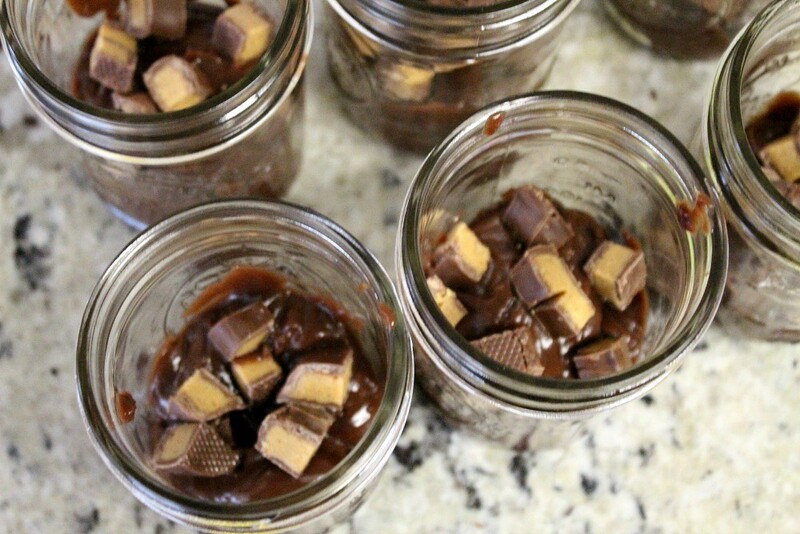 There are a couple of reasons why I chose individual mason jars for this dessert. One, I absolutely love the way they look on a tablescape. Little jars lined up ready to be grabbed and devoured are just perfect. Two, they’re portable! Before you add the Easter scene on top, you can put the lids on these, take them where they need to go and then finish them off when you get there. Easy peasy. 1. Mix up the chocolate pudding with the 3 cups of milk, according to the package directions. Set aside. 2. Put the 20 chocolate sandwich cookies in a food processor (or blender) and pulse until it’s fine and resembles dirt. Set aside. 3. 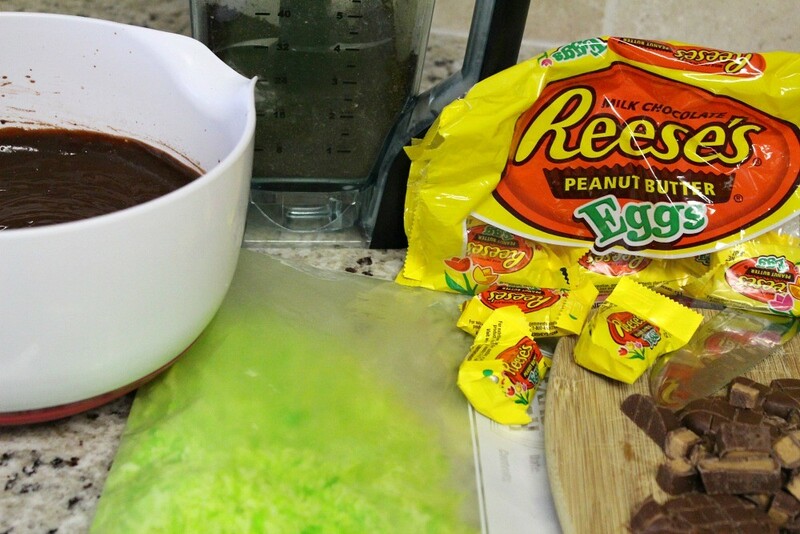 Chop up about 10 Reese’s Peanut Butter Eggs into half inch pieces. Set aside. 4. Put a cup and a half of sweetened coconut in a baggie and about 5 to 8 drops of green food coloring. Shake around until coconut is a nice shade of green. Set aside. 5. Now to assemble the dessert. 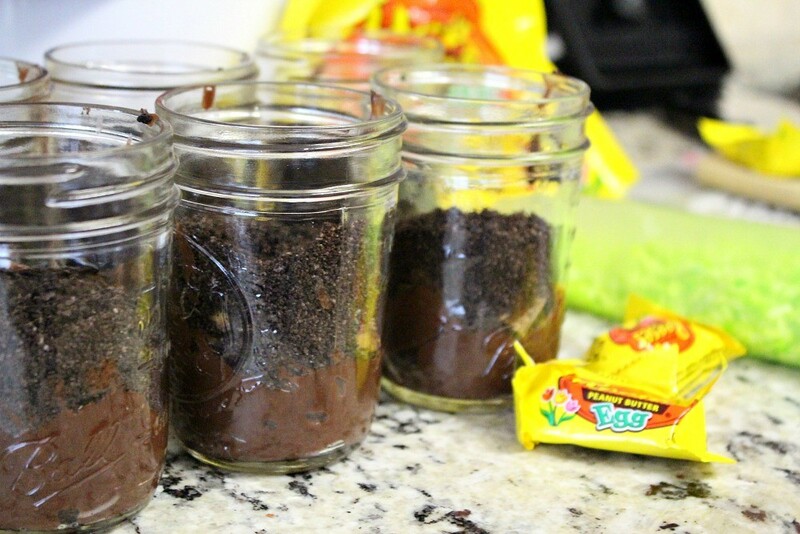 Put a layer of pudding on the bottom of each jar. Sprinkle on a few pieces of the Reese’s Peanut Butter Eggs. Spoon on a layer of the crushed chocolate sandwich cookies. Spoon on another layer of pudding, Reese’s candies and crushed chocolate cookies. 6. 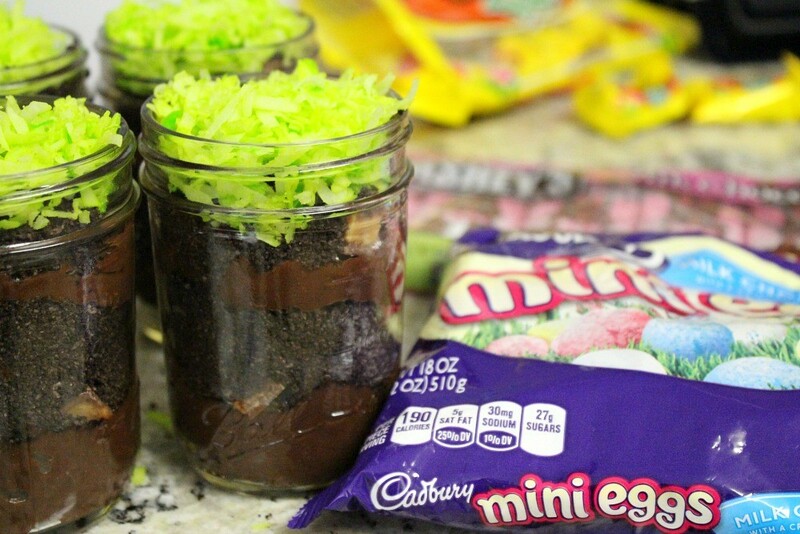 Sprinkle the green coconut on top and add a Hershey’s Milk Chocolate Bunny and a few Cadbury Mini Egg Candies. These are the perfect size for little hands to grab and devour. 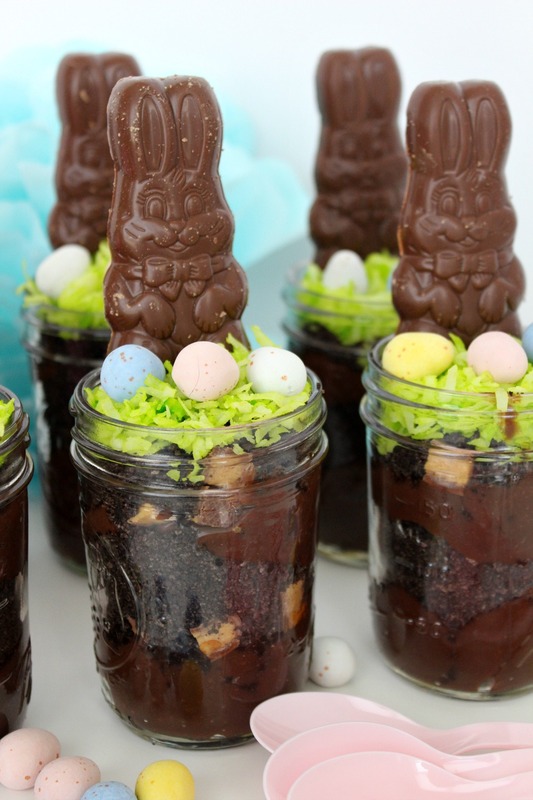 For your Easter tablescape, line the Easter dirt cake cups up and add some Easter decorations around them. I used tissue paper flowers, sprinkled some Cadbury Mini Eggs around and purchased pink spoons to add in even more Easter color. How did they taste you ask? When you combine chocolate pudding, chocolate sandwich cookies, peanut butter eggs, coconut and to top it off…make them mini desserts – you get one very delicious dessert. 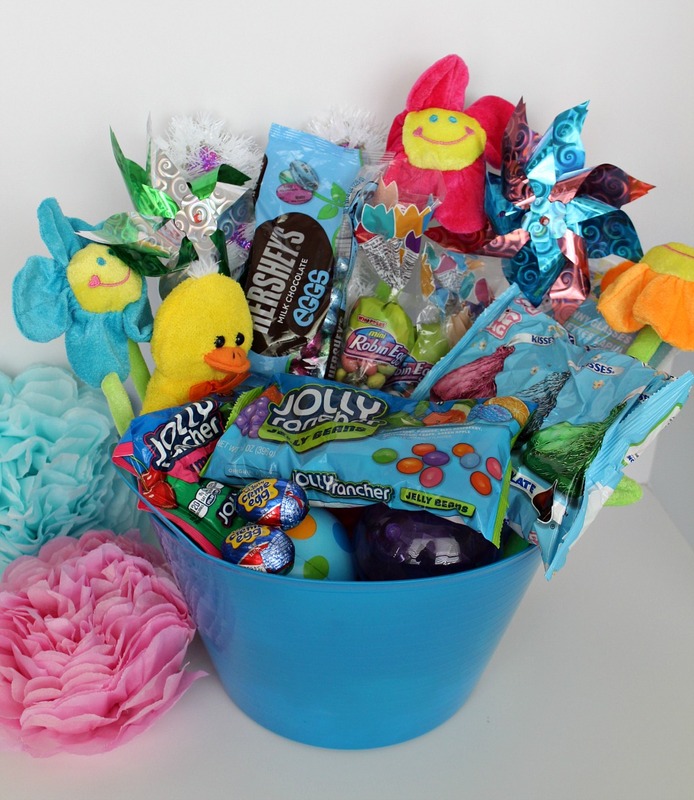 A tradition we started with our kids at Easter when they were little, was we would hide their Easter baskets full of goodies somewhere in the house. We would then set up a scavenger hunt and give them clues where to find them. The reason we started doing this was because when our first two were really young we lived in Alaska with the Air Force and it was still very cold with snow on the ground at Easter time. It wasn’t exactly great Easter egg hunting weather to say the least! So we made it fun indoors and the tradition just stuck as we moved from state to state. 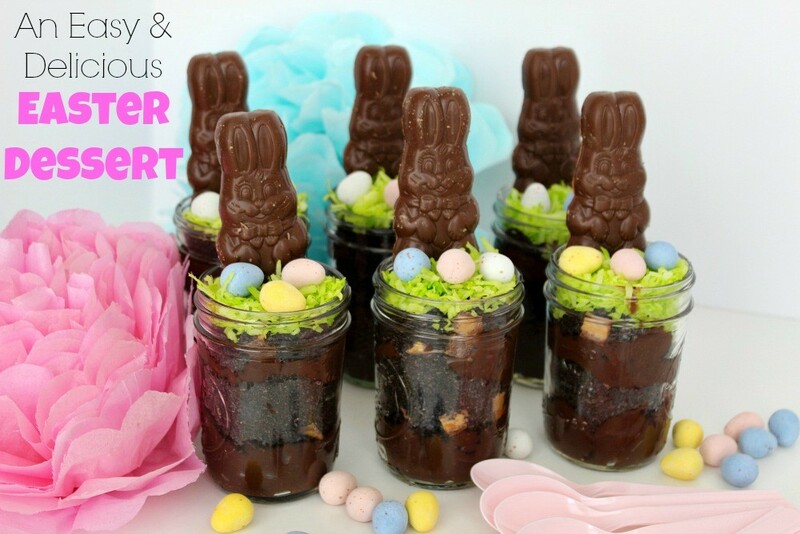 I have a couple more Easter desserts planned with the Whoppers Mini Robin Eggs Candy Carrot and the Jolly Rancher Jelly Beans, so check back for those! 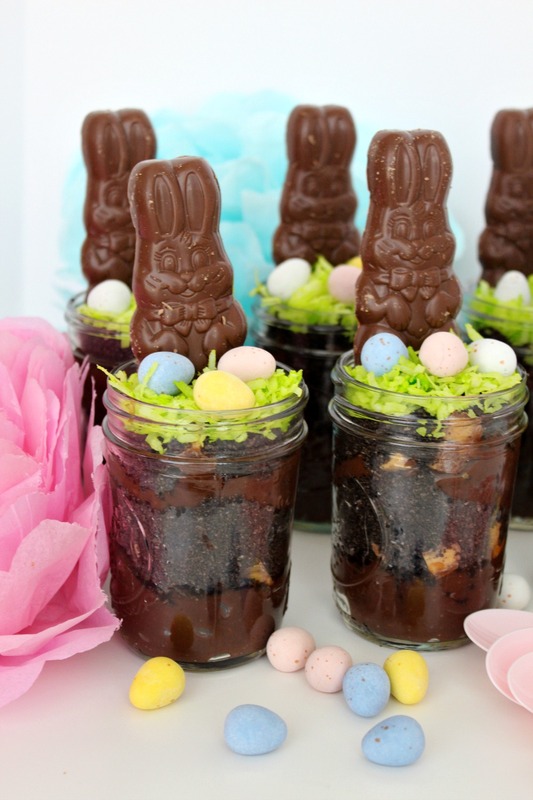 Hershey has such a wide variety of new and classic treats, filling this year’s Easter celebration with sweet treats the whole family will love will be easy and fun. What are your family’s Easter traditions? Does it involve a favorite dessert, candy or activity. One of my kids’ favorites is the classic Cadbury Creme Egg Candies. These have been distributed by Hershey in the U.S. for decades (I remember looking for these every Easter as a kid!) and combine traditional milk chocolate with a center of pure gooey goodness that people everywhere know and love. Hungry yet? These Hershey Easter offerings and more are now available at retailers nationwide. 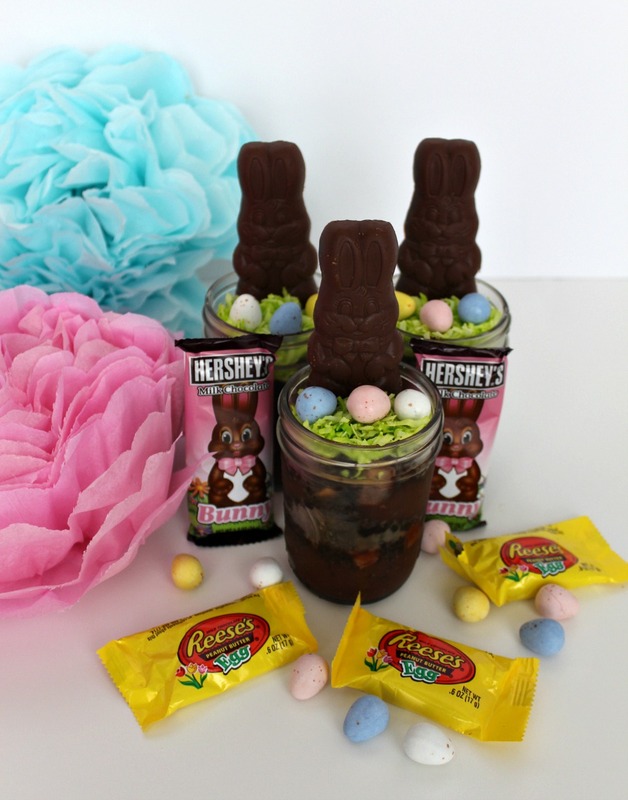 Visit Celebrate with Hershey’s for more creative and tasty #HersheysEaster ideas.